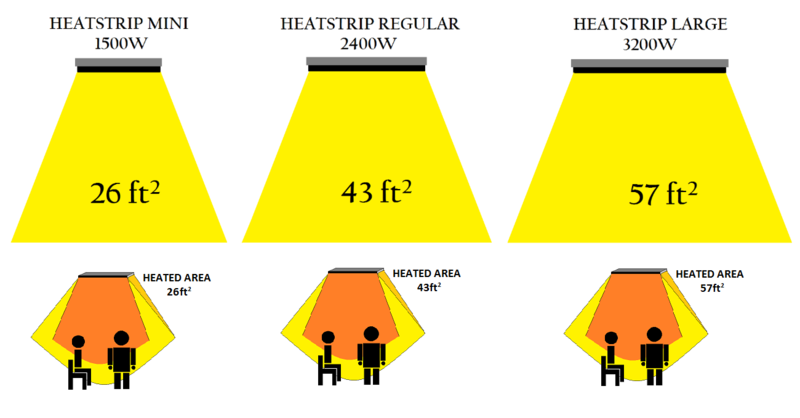 For more technical information on the operation and installation of your Heatstrip heater and accessories. The following table contains the dimensions and power specifications of all 5 models. 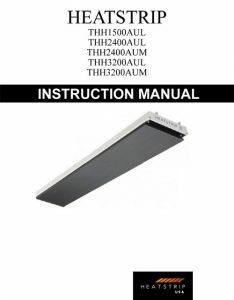 For more detail click the link to the manual. The following shows the approximate footprint of the 3 different sized Heatstrip heaters. The quoted areas are for an open outdoor area with one wall and a ceiling. The Heatstrip comes with the Standard Mounting Brackets in the box. These brackets can mount the heater to the ceiling or to a wall, giving it 4″ clearance. The Standard Mounting Brackets (Part No: ZBRAK-103) are adjustable and can be rotated from the 0 degree position to be 22 or 45 degrees. Electrical work should always be installed by a qualified and competent electrician to the local building standards. To check that the heater is running correctly. There are two components, the current and the voltage. 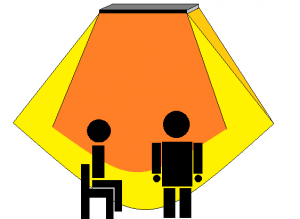 To determine if there is correct power, measure and compare the readings to the heater rating. It is recommended using a non-contact clamp meter to measure the current. The best place to measure is at the rear of the heater, or as close to the rear as the heater as possible. This will provide the most accurate reading as losses and interference are minimized. See the table above for the specifications. Match the heater model to the current draw. 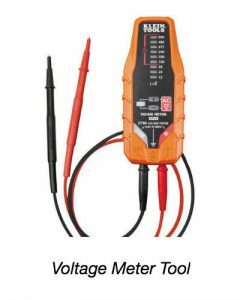 There are two options to measure the voltage. 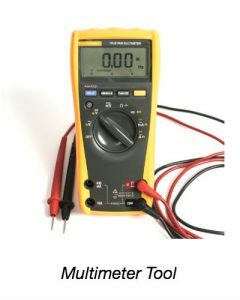 Use a multimeter or an Electronic AC/DC Voltage Tester -OR- Use the probes and test the voltage at the gangbox of the heater. This is the most accurate way to measure as line losses have already occurred. 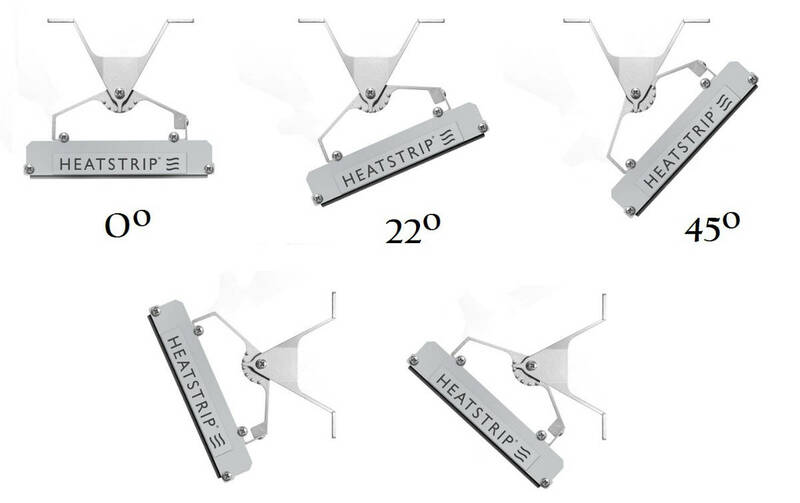 The Heatstrip heater is classified as a continuous load. They are continuous as they can run for over 3 hours. When specifying the size of the branch circuit always used the maximum rated current. The element is an electrical resistive load. For branch circuits, the size of the circuit is printed on the rear of the heater. The size of the conductor used for the branch circuit is important as too small and it will overheat. The National Electrical Code (NEC) governs the size of the wire needed. The American Wire Gauge (AWG) is a common format to rate the size of the conductor and matches it to the current, length and ambient temperature. It is recommended to always install circuit protection for the Heatstrip heaters. There are a variety of products available and your electrician can help with this. To assist we’ve covered a couple of them. According to the National Electrical Code (NEC210 – Multiwire Branch Circuits), the Over Current Protection Device OCPD is rated to 125% of the rated current of the appliance. The OCPD is usually installed in the switchboard. A Ground Fault Circuit Interrupter (GFCI) also known as a Residual Current Device (RCD) protects personnel from a short circuit by measuring the imbalance of the load. It is recommended to install a GFCI on the branch circuit. This information is general in nature and is for education. Always refer to the NEC and local building standards to ensure a safe installation. The Heatstrip heater is classified as a continuous, resistive load. They are continuous as they can run for over 3 hours.